Bowers and Wilkins' CM speaker range has recently been augmented by four new models: including the CM centre 2 centre speaker, which is larger than the existing CM centre, the compact CM5 standmount and the ASW 10CM subwoofer. The fourth model, the CM9, is the top-dog in the CM range and physically the largest model. It has the most extended bass and given a suitable amplifier, will play the loudest. This makes it perfect for those looking for good sound quality delivered at realistic sound levels. It also boasts a level of fit and finish that is distinctly high end. To put it in context, the CM range – which slots between the 600 series and the highend 800s – started life as a single model, the CM1, an impressive quality compact which made up for its lack of cubic inches with better-than-average bass extension for the size and necessarily low sensitivity as a result. But it had limited trouser-flapping ability and needed a lot of power to have any useful output. The CM1 was eventually expanded into a fledgling range, which has recently been expanded further with additional special-application models, both for music and for home cinema/multichannel use. Hence the range now extends to two compact two-ways, two floorstanders, two centre speakers and a subwoofer. In contrast to the CDM range that preceded the CMs, the tweeters are fully enclosed and the enclosures are rectangular boxes, which means they look somewhat simpler and cost less to make. But this doesn't mean the designers have not addressed the aesthetic issues. The black gloss finish is first-rate, with excellent detailing and the standard of presentation really is the icing on the cake. This reviewer is not very enthusiastic about the silvery rings around the drivers, or the fact that the larger units have different colour cones for the midrange and bass (they use different materials), but the speakers are supplied with ultra-slim grills that attach magnetically to the front and effectively cover the working parts, without significantly detracting from the sound. The designers have opted for a narrow enclosure, achieved by using two small diameter bass units in parallel instead of a single larger one. The narrow baffle has the advantage of widening the listening window, so that several people can listen at once without a noticeable loss of image focus. A single larger bass unit would have had the opposite effect, namely narrower imagery and a more restricted listening area. To ensure stability, the speakers come with some plain rectangular plinths, which usefully extend their footprint. You also get carpetpiercing spikes and hard, round-section feet as an alternative, with enough adjustment available in each case to take care of uneven flooring. It's a great-looking package, with the emphasis on elegance and practicality compared to the 600 series, which look superficially similar, the CM are better specified. For example, they are fitted with longer voice coils and bigger magnets which translate into greater power and less distortion. Cabinet bracing is also improved, and the cabinet walls are covered in real wood veneers, which helps stiffen the enclosures, in much the same way that bread helps stiffen a cucumber sandwich. The veneers are also reflected in superior finish. As the biggest model in the range, the CM9 has the highest sensitivity – 89dB/watt nominally, where the cM1, for example, is rated at a lowly 84dB – so you gain at both ends of the volume spectrum. The CM9 doesn't need to be driven hard to perform well and it will cope with more power for longer should it be required and when the amplifier allows. The frequency range covered by the cM9 is 30hz – 50khz at 6dB and is more tightly specified at 56hz – 22khz +/-3dB. We haven't see the response plot, but most of it probably lies below the line, between 0 and -3dB, with the output holding within 2dB over a ten degree vertical arc and 60 degrees horizontally. Impedance is nominally eight ohms, but dips to three ohms, which means it is best thought of as a six-ohm load, though the 89dB sensitivity means that you shouldn't need too much power to get a good result. The main test amplifier was a Krell fBi, which can deliver 300 watts per channel without breaking a sweat, which is more than sufficient horsepower for any reasonable use. But in a brief outing with a high-quality 50-watt integrated amp, the Denon PMA-SA1, even this reduced power level was sufficient to propel the CM9 a long way, with no danger of hitting the end stops in a room which is more than eleven meters long. This is not a hard loudspeaker to drive. You wouldn't expect a modern Bowers and Wilkins to be far from tonally neutral and the CM9 doesn't disappoint. This is palpably a very accurate loudspeaker with a full, but well contained bass and a treble quality that has come some way from the occasionally thin, edgy quality of some earlier generations of metal dome tweeters. It's not that the company's speakers were particularly edgy, but there was something about their tweeters and the slightly antiseptic way the treble was framed as a whole, that somehow underlined the high frequency output. it seems that the process of continual refinement really has delivered the goods and the result is a speaker that is palpably better integrated and that sounds less loudspeaker-like – more transparent if you will. In part, this is because it is no longer possible with this loudspeaker to hear the treble as a separate entity, independently of the bass and the midrange. The Kevlar FST midrange unit plays a part here by boosting energy in the middle and upper midband, the region just below where the tweeter takes over. 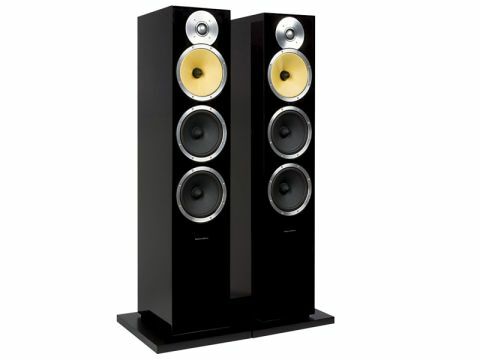 The result is a loudspeaker that is obviously smooth and in control, but is also capable of delivering real surprises when the occasion demands, one of which was playing a CD of wind music, a new Naxos title called Passaggi, which is scheduled for review in choice cuts next month. The exotic woodwind textures featured on this disc were beautifully handled, with a palpable feel of the player's breath energising the instruments. In track eight (part II of Nebojsa Zivkovic's Tales from the centre of the earth) the music has a tremendously exciting rhythmic pulse and here the CM9 brings a powerfully tactile quality and bite to the proceedings. We did notice a degree of interaction between the speakers and the amplifiers though, which in the worst case tends to induce a small, but noticeable amount of colouration and a degree of boxiness in the midrange. The bass is perceptibly warm when we used it without the foam ring or plug in the reflex port (they're supplied separately, with the advice to use them if the speakers are placed close to the wall behind). Generally the bass breathes better and gives a greater impression of differentiation in the depth plane, if some space is left behind the speaker and the foam is not used. This is a first-rate newcomer, easier and more relaxing than some previous Bowers and Wilkins, with a more expansive sound and a better-integrated treble. it is realistically priced, and beautifully finished, but take some care over set up. The speaker does offer a wide listening window, which is not just limited to a point immediately between the two speakers. It is quite transparent, though, and should be used with clean-sounding electronics, if you don't want to excite the slight residual boxiness identified above.